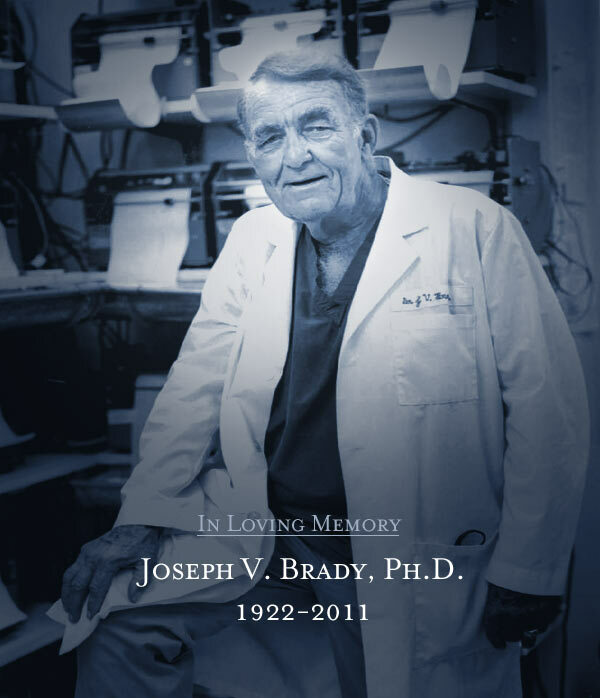 Joseph V. Brady, Ph.D. - 1922-2011 - Institutes for Behavior Resources, Inc. Institutes for Behavior Resources, Inc.
With great sadness we report that Dr. Joseph V. Brady died on July 29, 2011 at the age of 89 in Baltimore, Maryland. While Joe will be greatly missed by family, friends, and professional colleagues, the family is grateful that he was able to fully participate earlier this year in celebrating the 50th anniversary of the founding of the Institutes for Behavior Resources (IBR), the non-profit organization he established to enhance scientific understanding of behavior and apply behavioral principles to the solution of human problems. The anniversary dinner on May 2nd honored Joe for his life achievements and was a welcome opportunity for all who knew and loved Joe to thank him and show their warm appreciation. The Brady family thanks all who participated in making the event a fitting memorial, with Joe in attendance standing on his own two feet, as he wanted to be remembered. A small, private ceremony at Arlington National Cemetery is planned for the near future. Click here to view the obituary as well as those published by the Baltimore Sun, Washington Post and additional memories of Joe compiled by IBR.